Personalize your whirlpool bath with this eight-jet whirlpool trim kit. These attractive jet fixtures are constructed from durable plastic, and are available in a variety of metal finishes or color-matched plastic. Designed for easy installation, the jets can be inserted directly into your whirlpool's jet housings. 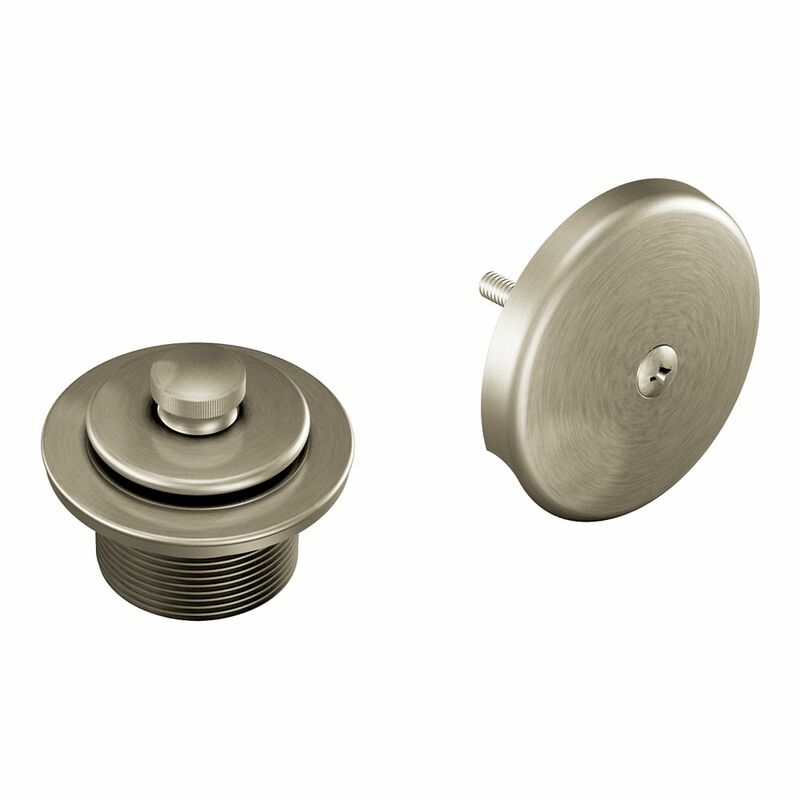 Metal finish kits also come with a matching suction cover, which fits over suction openings. The Roth bury line offers a relaxed blend of vintage design and traditional elements that coordinates perfectly with both casual and luxurious decorating styles. This oil rubbed bronze posi-temp<sup></sup> valve trim was built to last by Moen. Designed for use in your bath . The Icon collection offers a modern style that perfectly fits contemporary decor. Icon combines urban chic that takes the ordinary to the extraordinary. A full suite of coordinating products is available to complete your bath. Push-N-Lock Tub Drain Kit With 1-1/2 inch Threads in Brushed Nickel From finishes that are guaranteed to last a lifetime, to faucets that perfectly balance your water pressure, Moen sets the standard for exceptional beauty and reliable, innovative design. Push-N-Lock Tub Drain Kit With 1-1/2 inch Threads in Brushed Nickel is rated 4.3 out of 5 by 41. Rated 5 out of 5 by Shawn from This looks great and was very easy to install. ... This looks great and was very easy to install. Rated 5 out of 5 by JS from Worked very well! Worked very well! Rated 2 out of 5 by Angel from Doesn’t fit. We need a other cover said our plumber.... Doesn’t fit. We need a other cover said our plumber. A cover with two screws, I don’t know why. But have to return that. Rated 5 out of 5 by Dario from Easy install, looks great!... Easy install, looks great! Rated 5 out of 5 by William from Easy ordering, easy install. Makes it a quick and easy... Easy ordering, easy install. Makes it a quick and easy DIY project. Rated 5 out of 5 by mag55 from Great product at an excellent price. Condition-brand new. ... Great product at an excellent price. Condition-brand new.